Bathtime is my favorite time of the day with my kids, not because it means bedtime is around the corner but because both of my kids, absolutely, come to life in the tub. It’s a time for one on one play with Mommy or Daddy, a very ordinary moment but one I cherish so much. Buba gets his mohawk going, and his big duck quacking while Daddy or Mommy suds him up. He loves splashing and using the water cup to pour water out of the tub onto the floor. Eeek, messy, but he is so happy, his smile and cheekiness will put a smile on your face every time. Missy Moo is just as excited to rub-a-dub-dub in the tub! She instantly knows what’s coming and kicks her chubby legs and waves her arms franticly, as soon as I lay her down on her towel on the floor, to undress her. She blows her raspberries like she is ready to work on her bubbles in the water. It’s a precious time together, one I wouldn’t skip. I was always told, give your kids a bath before bed, it’s calming, it prepares them to settle down for bedtime. On what planet? My two kids act like they are in disneyland, on a sugar high. Buba can hardly sit still afterwards for his bedtime story, he is so giddy. It’s highly amusing. He soon settles down, about page 5 and is always ready for bed by the end, thank goodness. These may be ordinary moments but as parents these moments are the ones you want to remember forever! Thank you Katie and your wonderful linky, I am now, focusing more on the ordinary moments that might have otherwise been forgotten in the future. Thank you Katie, of course I adore your blog or maybe border line obsessed, apologies. lol Are you going to BritMums Live in June? I am looking forward to meeting all my favorite bloggers in person. Agreed, you can’t beat a good bedtime routine. Great ordinary moments. I look forward to joining in more with the ordinary moments when I can. Aww they both look like they’re having a blast! My two have always loved bath time too, it’s one of the highlights of our day! 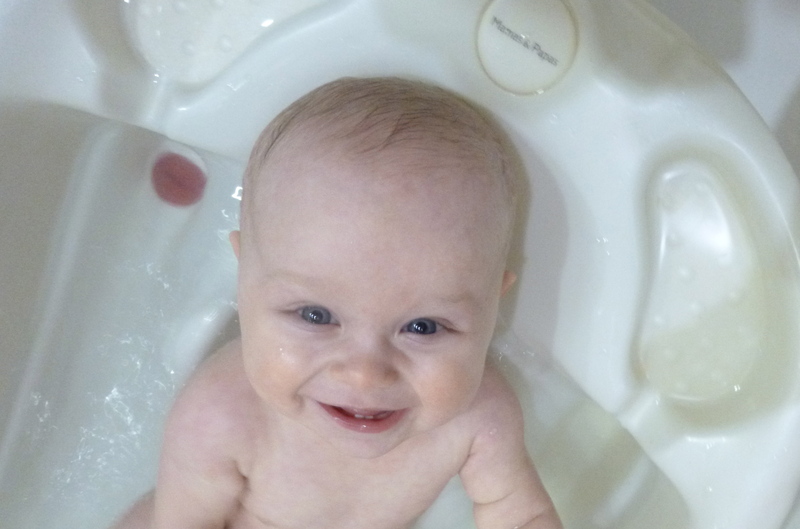 I love bath-time, so do the children, although it tends to hype them up rather than relax them! Exactly. I have never seen a calm children’s bathtime and I have 14 neices and nephews and two of my own kids. lol Although I am very keen on a calm bathtime for myself. hahaha 😉 What mommy isn’t? Capture those moments, mine won’t let me in a bathroom with them anymore. look at the cute hair do! bath time is always good! I have attempted the mohawk on Missy Moo, but her little fussy head just doesn’t have enough yet. Someday they will be matching in their suds. hahaha Always fun to bring out the child in us all!!! Thank you ever so kindly. Appreciate the lovely comment. Yes bathtime is the sure ticket to spike my kids’ into hyper mode for sure!!! Love your linky, and I look forward to sharing more #whatsthestory with you and all your link ups. Thank you so much for popping over and commenting. I am just learning photography so hoping they get better and better. Beautiful pictures! They sure look happy to be in the bath. It’s a favourite time of day around here too. Now my kids are a little bit older, they share a bath and we can enjoy a cuppa while they play. Good times. Awww your darlings are lovely!! I also love bath time and the snuggles that follow before bed with my girl! Thank you so much for the lovely comments and stopping by. I just love the ordinary moments linky. Life goes by so quick it’s good to cherish these more. Hope to see you here again soon. My Sunday Photo. Nothing says relaxation and celebrations than spending it at the spa with special friends.